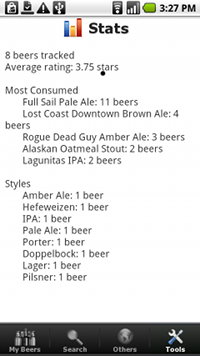 Beer Aficionados, keep track of your tasting notes and ratings the next time you try a new beer. 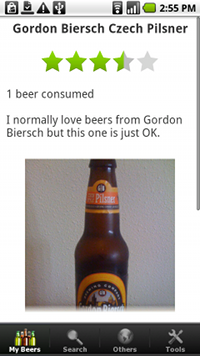 Share your beer ratings and notes with others or keep them private. • Take a picture with your phone to go along with your beer rating and note. 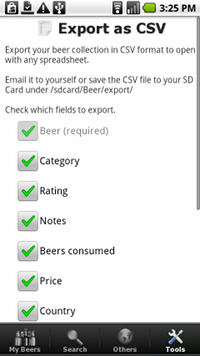 • Export your beer list in CSV format and save it to your phone's SD Card or email it to yourself. 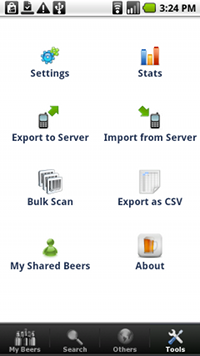 • Backup your beer list to the server. If you lose your phone or upgrade to a new phone, just import your list to the new phone so you don't have to re-enter everything. 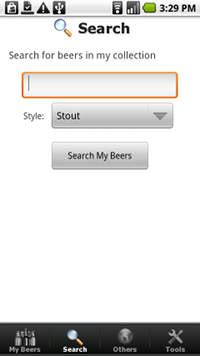 • Use the Bulk Bar Code Scan option to enter your beers by quickly scanning the barcode on the bottle with your phone's camera. 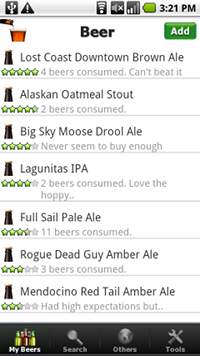 • Track statistics about your beers like Total Number of Beers Tracked, Average Rating, Most Beers Consumed, Number of Beers Tracked by Style.